2/6/2019 The Feast of the Exceptional Rose is upon us! Show your affection or scorn through unexpected and creative gifts! Love is as faceted as the jewel in a betrothal-ring. What will the season have in store for you? Companions in Fallen London - be they romantic, platonic, animal or mineral - offer boosts to your stats, and little stories. The Feast of the Exceptional Rose is an ideal opportunity to meet new ones. 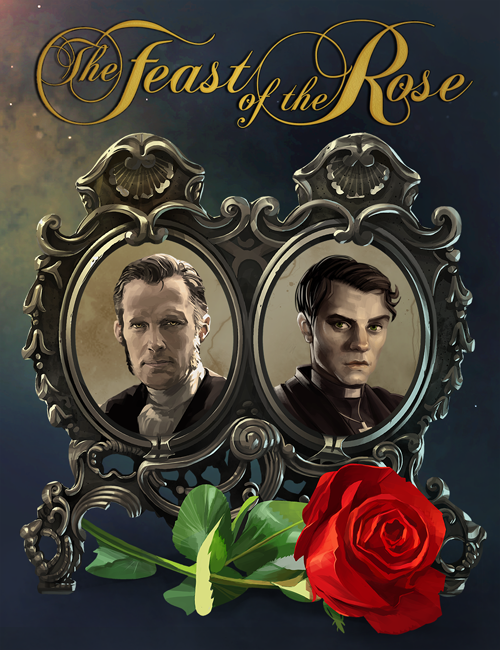 To discover the Intrepid Deacon’s story before engaging in the Feast festivities, play For All the Saints Who from their Labours Rest, an Exceptional Story available from the Fate page or from Celebrate the Feast of the Exceptional Rose. From the 13th of February (Update: now live! ), you will be able to draw the Lady in Lilac from your opportunity deck, allowing you to trade in your feast-gifts for Masquing. You’ll also be able to turn in your Masquing for special companions on the Encounters at the Feast card. The Clathermont Family’s Tattoo Parlour is the toast of Ladybones Road. Advertise on their behalf with this art print from our merchandise partner, GameTee! This artwork, which illuminates some of the designs available to the passing punter, is an A3 print which ships rolled. 2/6/2019 The opportunity to take the Deacon as a companion was all I wanted from this year's Feast, so I am thrilled about this news. Happy masquing to all! 2/6/2019 The Holy Husbando is back! 2/6/2019 New companions? New gifts? Let the Feasting begin!!! 2/6/2019 So wait the Contrarian can become a companion? How much random tat will I need and is anyone willing to give me some? 2/6/2019 I seem to remember that in prior years, the Lady in Lilac and An Encounter at the Feast become pinned storylets instead of opportunity cards toward the end of the Feast. Was that the case? And if so, can we get a confirmation/denial that it would work this way this year? 2/6/2019 Time for another spectacular display of extravagance! If I could ever afford one... Blast and damn. Please don't mind the dreadful username, it was completely unintentional. 2/6/2019 Adding the Deacon is a stroke of genius considering how popular the character was the first time around. 2/6/2019 So you need to finish an ES to get a new companion? This is interesting and I wonder if there are any other Fate costs associated to it. So you need to finish an ES to get a new companion? This is interesting and I wonder if there are any other Fate costs associated to it. 2/6/2019 You need to finish the ES to know who he is, not to actually get him. However, his masquing cost might be high. 2/6/2019 There's two new items tied for BiS BDR. The Lupercalian Mask is a +5 Shadowy, +2 Bizarre hat; the Set of Martyr's Bones is a +5 Shadowy, +2 Respectable home comfort. 2/6/2019 Yes, thought the same, but had some doubts! Want to remind you all that this time of the year, you can get rid of the devils by skipping to the end of the An Intimate of Devils story without selling your soul. Using one of the Feast card's option (from A dance with devils! branch), you gain, on average 0.8 CP of the required quality and to get from level 15 to level 18 you need 51 CP so, on average 64 cards. Thanks to Sir Wensleydale of Hardwick for pointing that you can use one of the two level 12 cards to increase this quality to level 15 without taking any risks. There's two new items tied for BiS BDR. The Lupercalian Mask is a +5 Shadowy, +2 Bizarre hat; the Set of Martyr's Bones is a +5 Shadowy, +2 Respectable home comfort. As for how to get rid of the devil cards... you mean, permanently? For good? 2/6/2019 I have deduced that the optimum grind for getting 200 Inklings Items (But really it's just the Roses) is to just go to watchmakers Hill and grind for 30000 Proscribed Materiel there that way you get enough Inklings to send someone 15 Roses, which should convert to enough Masquing on the 13th to get anything that isn't Fate Locked. Yes, thought the same, but had some doubts! Using one of the Feast card's option (from A dance with devils! branch), you gain, on average 0.8 CP of the required quality and to get from level 13 to level 18 you need 80 CP so, on average 100 cards. Oh. Well. I guess I SHOULDN'T HAVE TAKEN MY CHANCES WITH A DEVILESS TWO DAYS AGO, THEN, SHOULD I? It's also possible to raise An Intimate of Devils beyond 20 this year. Mine is at twenty (why?!... ), and I gained CP from the action. Also, you can get to 15 without risk, if you skip all Serious Offers. I tried to do that. I seem to remember that in prior years, the Lady in Lilac and An Encounter at the Feast become pinned storylets instead of opportunity cards toward the end of the Feast. Oh yes, we'll pin them towards the end of the Feast. Yes, without having to "lose" your soul to them. Oh, nice, nice! Never played the story so far and I didn't know about this option! Frigging neat! I'll edit the post, thanks! So you can get beyond 20? This is great and I need a new achievement! Probably 21 will be a good start.